February 8, 2018 is the next do or die date for Congress to pass a spending bill. If it doesn't happen, military members will be faced with another opportunity to work without pay. The lack of a paycheck is a big ordeal, of course, but it’s not the only hardship military families endure. Let’s hope we take some time to learn from the results of this recent shutdown and get preparations started, whether they are for days from now or further in the future. If you ask most people who didn't get paid by the government, the shutdown is another one of those events that people in Washington, D.C. perform to fill the daily news headline —because it doesn’t immediately affect them. But, as part of the nation’s collective military family, we know exactly what that means to us, thanks to the closures. Admittedly, some lack of resources are only nuisances, but others are downright unbearable. Thankfully, there are organizations dedicated to easing the shortfalls military families endure. *One of the biggest takeaways of the shutdown was realizing that each base funds programming differently. Decoding what facilities were closed seemed to be solved only by following each base’s social media for the most accurate information. If it appears another shutdown is unavoidable, what can you do to prepare? 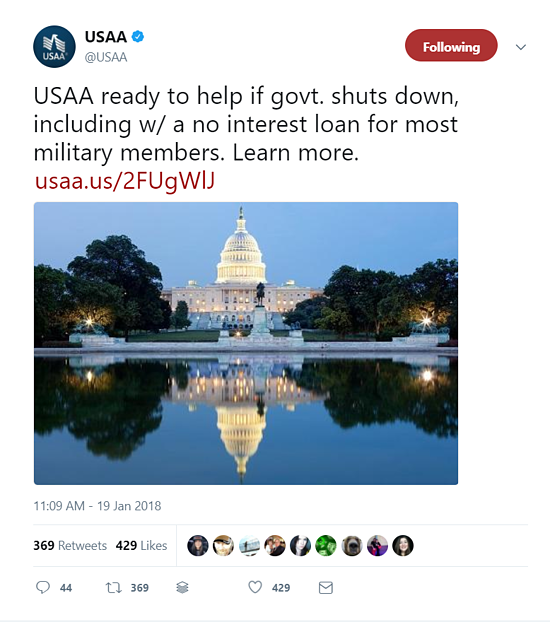 Companies like USAA stand ready to help with the hardships the shutdown created for military families. The shutdown probably made you think about things you could and should do better, like saving more money and perhaps finding a worthwhile financial planning system. Maybe the ineptitude also moved you to reach out to your Congress people, which is never a bad idea, even if they debate goes on as to the best way to reach them—mail, phone, or social media. Did you take note of the companies and charities that offered assistance to help military families and those who did not? This is important information to tuck away. Knowing what we do know, what more can we do to prepare? First, do your absolute best to find options to secure extra money if your savings account doesn’t have what you need. Whatever that means, whether it's taking on extra hours, clipping coupons, or adding a second income, now is the time to put it into action. If you’re temporarily set financially, keep in mind those who can’t make ends meet. Food pantries and other organizations who often supply military families with necessities will be pressed for donations. 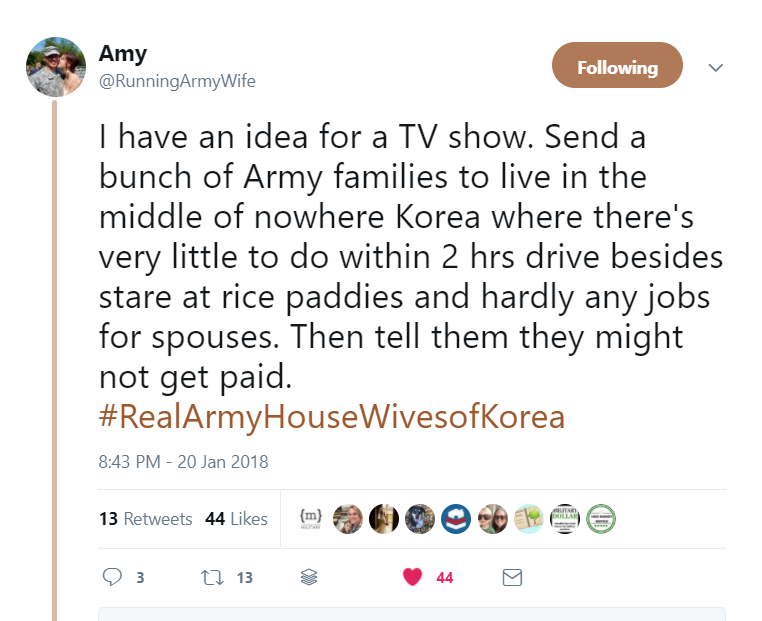 Many military spouses dealt with the latest shutdown with a bit of dark humor, like @RunningArmyWife on Twitter. When I asked a group of milspouse friends their thoughts on the shutdown, they replied that yes, they were annoyed and yes, they intended to reevaluate their finances, but the majority of them also mentioned something pretty significant. They were worried about the spouses less fortunate in the ranks--mostly young military families who earned less and struggled on a regular basis. A government shutdown affects them the most. Such a typical military spouse response. They are worried about other families down the line whose PCS plans were delayed or whose long ago scheduled specialty medical appointments were canceled. Typical for sure, but yet, truly special. 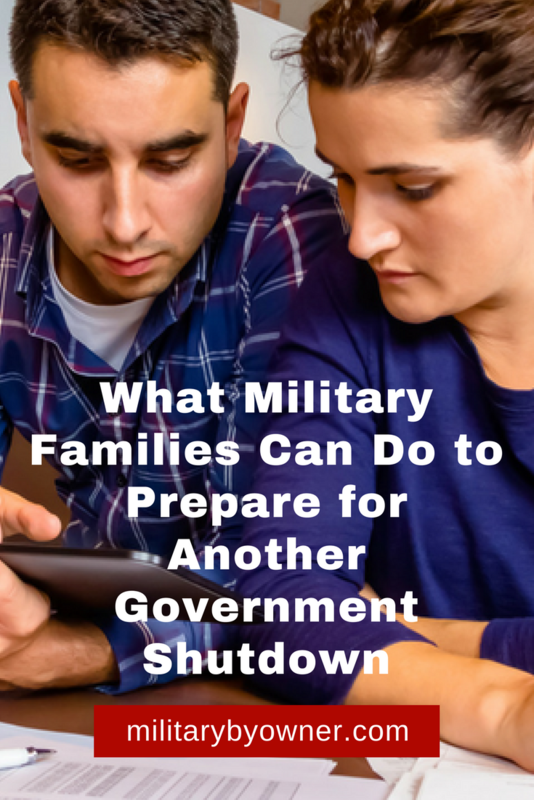 Another potential shutdown is looming, and you’re probably feeling helpless and very irritated that not paying military members is still an issue, but at least now we know what we’re getting into and can plan to beat the system as best we can. What are you doing to prepare? Leave a note in comments below or join the discussion on Facebook.